Up for consideration is a clothing pattern to fit the 14" Kish Dolls; Wren, Piper, Raven & Lark. The pattern includes a long sleeve turtleneck top with snap closure in the back, a pleated wrap skirt and a long sleeve jacket with three pockets. Included are separate pattern pieces, instructions and photos of possible outfits. Pattern has been designed to use with tee shirt knits, light weight wool and wool blends and similar weight fabric. 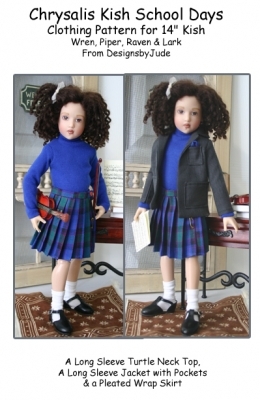 This design is also available forr43cm BJD MSD dolls, Ellowyne Wilde and Marley Wentworth. The PDF version prints on 8 1/2 x 14 legal size paper.